Image caption Ring-edge disturbance: The object would become the 63rd moon in Saturn's orbit if confirmed. Informally named Peggy, the object would become the 63rd moon in Saturn's orbit - if confirmed. Scientists noticed a bump or distortion on the edge of the ring that they believe indicates the presence of some kind of object. It is estimated that Peggy may be about a kilometre (half a mile) in diameter and it is almost certainly made of ice. "All we know is that something is there - what we can track is the effect of an object in the rings perturbing the particles around it, creating a disturbance in the rings." The disturbance in the edge of the ring is 20% brighter than its surroundings and about 1,207km (750 miles) long and 9.7km (six miles) wide. Details were published in the journal Icarus. The significance of the discovery is that the image may have captured the moment of the moon's birth amid the clouds of ice particles making up the rings. According to Prof Murray, "the rings are icy, more than 90% pure water-ice, so with the particles colliding you have the ideal conditions for objects to accrete, for objects to form in this region, and images do show this kind of clumpiness". 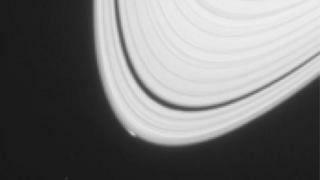 The most obvious theory is that because the rings contain so much ice, and because many of Saturn's moons are composed primarily of ice, the rings provide the nursery for new moons before they migrate to more distant orbits. What happens to Peggy now is not clear. If it continues to orbit inside the rings, it runs the risk of collisions with smaller lumps of ice with the likelihood of the tiny moon disintegrating. However, if Peggy escapes beyond the rings, it will run the gauntlet of drifting through the paths of much larger moons. In any event, the moon's small size means that if it does migrate beyond the rings, it will be impossible for the scientists to keep track of it. Prof Murray said: "Peggy is trying to make its own way in the world. If it escapes, it has to get past some much larger predecessors and if it avoids them it may still get hit by a meteoric bombardment. "Babies are safer in the womb but they have to leave sometime - and the paradox is that to get to safety Peggy has to pass between other much larger objects." One hope is that during one of Cassini's final orbits, in 2016, the spacecraft's narrow angle camera may be in a position to offer a far more detailed view of the outermost "A" ring, providing a chance to observe Peggy's fate.